Let’s get brutally honest. I never thought I’d still be blogging here right now. When I first started blogging back in February 2014 (see my introduction post here), my goal was just to get out of credit card debt. At the time I had nearly $150,000 in total debt, and that amount seemed totally insurmountable. (See my first ever debt post here or read about what lead me to start my debt-reduction mission here). I had over $10,000 in credit card debt, so that was my original goal when I started blogging here. With a household income of about $45,000/year, I thought it would likely take 12-18 months to pay it all off. I shocked everyone (myself most of all!) when I somehow managed to pay off my final credit card (over $10k in total credit card debt), in just shy of 3 months!!!! Where had all that money come from? It didn’t even seem mathematically possible, but the second I put my mind to it, things just started happening. Hubs’ got some big checks, I got some big checks, and we absolutely slashed our spending and expenses down to next-to-nothing. We ended up paying off over $25,000 of debt (+interest) in 2014. We went on to pay off over $26,000 of debt (+ interest) in 2015. And we kept the train rolling, paying off over $30,000 of debt (+ interest) in 2016! After just shy of three (long and hard-fought) years to get to this point, I finally reached the half-way mark in my debt-eradication journey in February of this year. “The debt will just start melting away”, they said. “It will start going so rapidly”, they said. “It will feel so easy in comparison to the start”, they said. “They” lied. Or maybe not lied, per se. But they were wrong. It’s not any easier. The debt is NOT falling away. And I do NOT feel like it’s a downhill run, easy in comparison to the start of the journey. If anything, it’s the hardest now that it’s ever been. One goal about debt eradication, one about saving, and one that’s just a total splurge. Guess which of the three actually happened? Just the splurge. That’s it. We will likely have nothing to put into a Roth IRA this year. No extra money for savings of any kind really* (*caveat: my employer requires a mandatory 7% retirement contribution and provides a full match, so I do have a pre-tax retirement account that’s being funded. But no additional savings of any kind – no liquid cash in a savings account, no Roth, etc.). In terms of debt, we’ve managed to actually increase our debt burden. Things have been rough since April – first discovering a HUGE tax liability we had (still have), and then when my part-time job ended, hubs’ work ended, and the entire summer (May-August) we kept on spending like we had this phenomenal income (we’ve grown used to an income around $10,000/month), but my first full-time paycheck at my new rate of pay indicated that I’d likely only be bringing home around $4,500/month. It was a HUGE wake-up call. HUGE. We’re still making pretty hefty debt payments, but it’s to the IRS and credit card companies in addition to the student loans I’d finally thought were starting to get under control. We’ll still have paid a good amount toward debt this year, maybe $20-25,000. But I doubt we’re going to hit that $30,000 mark that we’d planned on. Oh yeah…..and now we’re starting off in a worse place than we were at the start of the year because of all our new debt that’s been tacked on for the ride. I have lots more to share about how our debt increased – all the over-spending we’ve been doing (and some unavoidable medical expenses, as well). But I’m going to save the nitty-gritty details for another post. Right now, I just wanted to reflect on where we’ve been, where we are now, and where we hope to be in the future. Getting out of debt is hard work. Especially with the amount of debt that our family was grappling with. $150,000 is no joke. No small stuff to scoff at. It’s the real-deal, legitimate, takes years and years and lots of hard work and persistence type of debt to get out from under. Life continues to happen. Life doesn’t care about our financial goals and our hopes and dreams and what we’ve got planned. Life just comes right at you full-force with job changes or job loss, unexpected health issues, costly car repairs, etc. Kids grow up! When I first started blogging here my twins were 18-months old! Now they’re five and entering kindergarten! Life doesn’t just “pause” and allow us to get out of debt real quickly so we can take our kids on fun trips, make lifelong memories, and allow them to participate in all the activities and extracurricular that I would prefer None of that stuff happens. Kids grow, parents age, emergencies (of the major + minor kind) occur. All while just trying to scratch and claw and slooooooowly climb out of the giant hole of debt that is our financial life. It’s tough. And it’s not fun. But I also cannot wait. I want to scream it from the rooftops: I CANNOT WAIT TO BE DEBT FREE!!!!! Back when we made our financial goals for 2017 we were anticipating being debt free by early 2018. Sorry to say, but it’s going to be longer than that, folks. Hubs is back in school (= no income currently and only the possibility of part-time employment at best) and my income is pretty well “set” without a lot of room for flexibility. I just got a huge raise, but had to sign a non-compete for the next 3 years (lucky I love my job and where I’m at, but it means no chance of additional or outside employment in my current field for the time being). Without a chance for any significant increase in household income for now, our only option is to get our spending down. Spending, which has been a HUGE issue this summer. This, to undoubtedly be the topic of several blog posts in the future. I have to be honest. I don’t feel as much excitement as I used to. I don’t feel the same level of passion and enthusiasm. Right now, I’m just worn down and tired. We slacked off big-time this summer – I must admit. So it’s not like we’ve been living the rice-and-beans life for the entire 3.5 years. We did for the first 2 years, but our spending as of late has been unacceptable. So there’s certainly room for improvement. So right now I’m just going to put out the big “pie in the sky” type of goal. We’ll get around to all the numbers and the concrete financials. 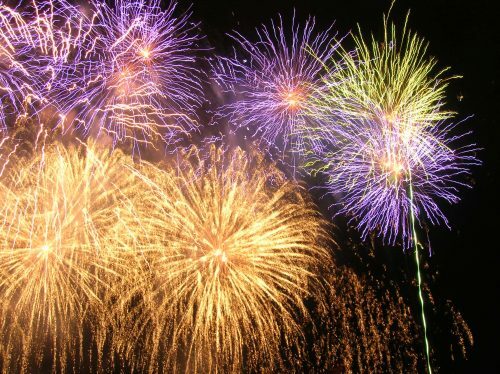 But for now I just want to declare: 2018 will be our year!!! I don’t know that it’s possible. In fact, I think it’s likely a mathematical impossibility right now. But so was that $10,000 of credit card debt. And somehow, someway we managed to pay it off in 3 months. So I will keep the hope. We may not be done in early 2018 as originally projected, but I’m going to make it a personal goal to figure out how to sell any and everything of excess, how to totally scrimp and save and cut out all unnecessary spending and once and for all just GET OUT OF DEBT BY THE END OF 2018. December, I’m looking at you! What a wonderful Christmas present it would be to our family and ourselves to make a final debt payment in December 2018. It’s happening, folks. This debt is going down! What are your current debt-reduction goals? 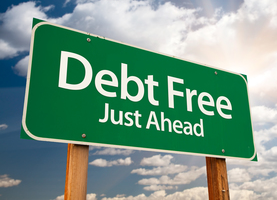 When do you plan to be fully debt-free? We’re gonna be here with you, cheering you on. You may just want to focus on what you have accomplished for a little while, rather than looking at what’s left to do. Take a little time to recharge, and make some small changes to get back on track. You’ve hit mile 17 of the marathon. The end is in site, but it’s okay to just focus on putting one foot in front of the other until you get another wind. Amen to that! Thanks for the kind words of encouragement! One of the things I’ve learned about my debt journey is that it is never linear. There are hills and valleys. The most important thing is that you keep on going. I’ve been following your story from the beginning, but it’s my first time commenting here. You have been so inspirational to me… so glad to see you back. I love this post. Getting out of debt is hard, long, draining work. It took us 10 years to pay off our 200k+ student loans and car debt. And nothing waits. We went through 5 job losses, 6 apartments, a 2+ year stretch of unemployment, marriage, retail jobs to make ends meet, a move across country, a landlord stealing our security deposit, huge interest rate changes (both up and down), and lots and lots of miscellaneous stressors! With high debt you really need to find a balance when you’re in the home stretch. And it is definitely a moving target Don’t feel bad about the splurges or setbacks. Just try to find something sustainable and keep thinking outside the box. We added big vacations once a year when we hit a certain milestone and make sure to budget entertainment money. WOW, so you’ve just hit the year-mark with no loans!!! Major kudos! Thanks for reading and offering the kind words of support. It helps to hear from someone who has “been there, done that” and made it to the other side!!!! Don’t get so down on this year. 2017 is not shot – there is still over 1/4 of it left!! You’re in a position where you have more family time than you have ever had. Your kids don’t need you to spend money in order to have quality time – you just need to be there. My personal favorite is a family walk. It’s a great time to talk about anything and everything and burn off some energy and stress at the same time. Can we talk about the elephant in the room…..the home purchase? I know you are thrilled to have purchased your home and you can’t go back. But I think it is important to acknowledge that if you had waited, youwould have had more cash to weather the unexpected storms. You used up your cash reserves for the home purchase figuring you could quickly replace them then life happened. It happens to all of us! The only thing you can do is go foward. Remind yourself through all the pain that you have your home now but will have to work really hard and make some sacrifices to keep it. Is your home worth cutting spending to bare bones? Is it worth picking up an extra job? Is it worth limiting the extracuricular activities? I think your answer would yes! YOU CAN DO THIS! You have not failed, you just took a little different path than planned and it was a little (or a lot) rocky! Time to re-group and finish! Best of luck and thank you for sharing your journey! I have the same thoughts in regard to the house. BUT! I also agree you can turn this around. You’re definitely right. Using up all of our cash reserves was a super risky and ill-advised move. But, to be fair, buying the home has actually reduced our monthly rent amount by $300/month (our mortgage is $950/month compared to our rent of $1250/month). Still should’ve probably waited longer and hindsight is always 20/20. We did have a decent EF at closing time (it ended up getting allocated toward taxes when we saw how much we owed). Ultimately, we’d have a lot more liquid cash if the sale hadn’t gone through. But I don’t think the house is out-of-line with our budget or anything. If anything, it helps since we’ll get the homeowners tax credit and have locked in a super low mortgage rate. You make good points! $300 reduced housing cost is a big deal now that you have a lower income. I apologize for being harsh. I need to remember that I only see part of the picture! The home purchase not being mentioned was the first thing I thought of, too, Margann34. Ashley, you are still in a good position. You have a really great income and have paid off a whole lot of debt. The amount of debt that you started with was not going to go away quickly, as you said. I’m in the same boat as you are. I’ve been at this since 2011 and have paid off more than $100,000 but still have $54,000 to go. This race is certainly not for the faint of heart – keep plugging along!! Don’t beat yourself up over this summer’s spending. Just get back on track and finish the race. We’re all pulling for you! Thanks Sarah! Sounds like we had a pretty similar starting debt load (approx 150k). It’s such a huge mountain to see from a distance! Congrats on being 2/3 of the way there! Instead of worrying about the amount of debt to payoff, concentrate on getting lower rates. You’re settled into your house and just got a huge raise. Now sounds like the perfect time to refinance your loans. I bet you can get them down to 4% or less. It’s like an instant spending cut because more of your money is going to principal than interest. You can do this all online with minimal effort. As a bonus you will get sneaky Navient off your payroll! Now for the debbie downer… I must have glanced over the end of your post. There is no way you will pay down 70k in debt in 16 months. Setting that as a goal is only going to get you disappointed. If you’re the sole earner, I estimated That is nearly entire salary after taxes (not including childcare, health insurance, or any monthly expenses). Let’s be honest you aren’t going to make that up with part time work and selling stuff around the house. You made choices to begin to create balance in your life. Own it. Live it. You can’t have everything all at once! Instead you should be focusing on getting smarter with money. Work on lowering interest rates. Understand your taxes and tax credits. Budget consistently off of “real” numbers instead of hopeful thinking. You can do it. But I’m afraid by making such lofty and near impossible goals you are making it harder on yourself than it needs to be. I admire your hard work and honesty. I think that will get you through these hard times. But. Enjoy your girls, your career success, your house and your husbands new opportunities. You can be proud of all you’ve achieved. Thank you for the kind words, Maureen! One fact that hasn’t been mentioned is that you paid off a great deal of debt in 2016 because you didn’t pay the appropriate amount in taxes during the year. If you had, you wouldn’t have had that much cash to pay towards your debt. What you are experiencing now is (hopefully) good financial planning so you won’t owe so much in April. It is a learning experience. We went through something like that once. I thought I had this huge cash cushion and then had to send most of it to the IRS. Ashley, I do love you! What a great job you have done with paying down your debt. And, yes, I know you would like it to be gone already. But you will get there. And the success will be all the sweeter ! Thanks for still blogging. I love reading your updates. And I feel as if I’m watching your little girls grow. Sending hugs to all of you. Everybody reading this entry of yours will be pulling for you–feel our thoughts for you, surrounding you all the time. Right along I have felt so, so sorry for you, having been suckered into the “pay thousands for your education” scams. WhenI first met my husband I was a widow with two children–into the work place again for the first time in 9 years with two children and a massive pile of debt from my first husband–which I had known nothing about. I won’t bore you with details, which included losing many of our possessions in Hurricane Floyd, but I met my now husband (41 years ago) and we went back to graduate school together, with full time jobs also, at the University of Texas at Austin. It took us years of slogging to get debt free and then onto the delightful, just as difficult, path of savings. Don’t set impossible goals for yourself but live very very frugally, enjoying each other and your children. Your husband needs a job immediately. Being a full time student can be managed also.You should not be shouldering this burden alone, it will be bad for your marriage to carry such a strain. Take care of yourselves–good health and a loving relationship are the best gifts you can have . I love the final sentence you wrote here. Truer words couldn’t be spoken! Thank you for sharing this post. Back when you started I had submitted my story and had a ton of credit card debt, student loans, car loan and a then new baby. I too have gone through years of successes, set backs and lifestyle creep. I was able to pay off all credit card debt, we bought a house, had to sell my car back (Thanks VW) and keep trying to pay down these horrid student loans. So at this point we’re at 59,000 in debt including the house (most is student loans though).Your story is a good reminder that we’re all human and that we’re faced with choices all the time, but that it is doable. Personally with everything that’s going on I think you’re in a good place now. Are you still creating goal pictures for debt payoff like the one you did for the Car and I think a few other things? I think it’s great that your husband went back to school, I’m wondering if he’s at the point where he can work on getting a paid internship? Even if his program doesn’t require them I know many will still give credit for internships as an elective. Plus gets a foot in the door somewhere. Great job, now to finish the marathon. What a great post and so REAL! It’s been a tough ride for you, slogging away that debt, but don’t give up! This is a dangerous place where many people might just throw in the towel and live with debt forever. You have had a halfway wake-up call and that is a good thing! Just keep fighting that good fight. Don’t fret too much about the whole experience thing for your kids. What I have found as a mother of four grown children and now grandchildren is this–kids just want YOU! My granddaughters have rooms full of toys, lots of outside activities etc., but what they really want is to play a silly little game with their grandparents involving little 99 cent tops. Take a look at this blog sometime–www.faithfilledjourney.com to see another family tackling student loan debt. They have 3 (soon to be 4) kids and started out with more than you. Good luck! Thanks for the blog recommendation – I’ll check it out. Thanks, too, for the reminder about what’s truly important in life! I couldn’t agree more! Kiki is so right! My children, who quickly became “Our children” Thought it both funny and clever that we were also having classes and exams when they were. They accepted so much as normal even our beans and rice and rice and beans diet only produced a few moans. In fact years on my by then married daughter asked me “What was that beans and rice thing you cooked all the time. I’d like the recipe”. It is a good one–from Diet for a Small Planet–a cookbook you might enjoy. OK. I’ll keep out of your hair from now on–but loving thoughts to you. Thank you! I’ll have to check out that cookbook! Ashley, Don’t get discouraged as you have done an amazing job. My counsel is to remember life is a journey and not a race. I keep setting aggressive financial, weigh loss and personal goals for myself and have to be reminded to stay on the path but not to forget to live a balanced life. My goal to be debt free by retirement in a few years is a similar daunting task that gets evaluated every time I sit through another friend’s memorial that left us too soon. ‘Slow and steady wins the race’… Cheers! I would suggest making some smaller goals that are achievable milestones which you can get excited about reaching. For example, if you never ran and your singular goal was to run a marathon, you’d probably get frustrated after a few weeks and quit. You’re debt, as you mentioned, is a major project so you’ll get there eventually! Great posts, I enjoy reading about your awesome progress. Great idea! I need to come up with some smaller goals ASAP! I second the making smaller goals. The first may be a budget that stops the bleeding (i.e. live within your means). The next goal may be getting back to where you were in March 2017. This could be split into multiple steps – paying off the credit cards, the irs load. Another goal may be fully funding the emergency funds and other special accounts. The last step would be to work on paying extra towards the student loans. As someone said further up the thread, the 2016 pay off was possible only because your income was skewed. I am right there with you!!!! I am shooting for Dec 2018 we have A LOT of debt to pay off by then .. But I am right there with you thats my target date, and your right what a wonderful gift that would be to give that freedom to my family .. This was encouraging! I feel like we’re taking forever to get out of $25k of debt but that’s okay. Slow and steady wins the race. I’m also glad we aren’t the only ones taking a little longer to pay debt down. We just finished paying our daughter’s hospital bill. The next one is my lower credit card of $490 and then on to the big ones. You’ll get there! We just finished paying off our 196k ( originally 180k but bought a care in the process) in June after the sale of our mobile home. We did it about 3 years, but sold our home at a profit to knock out the last big chunk. I know it is tough, but you can do it . You just have to keep going! Have you looked into refinancing your student loans? Can hubby get a part-time job to supplement your income? You’ve been at this a while so it might be time to start back at the basics again and see if you can reorganize your debt, and then go line by line through your expenses looking for places to cut. But I know you can do it! !